Norwegian Borge Ousland is one of the mots famous polar explorer of our times. He has crossed, solo, both the Arctic Ocean and the Antarctic. Børge Ousland was born 31st of May 1962 in Oslo Norway. He grew up on Nesodden outside Oslo. After high school he trained as a diver and worked from 1984 to 1993 as a saturation diver in the North Sea. In the period 1989-1991 Børge served his military service in the Norwegian Special Naval Forces. 2006, North Pole in winter. On the 23rd of March 2006, Borge Ousland and Mike Horn became the first explorers to reach the North Pole during the Arctic winter. This expedition is one of the highlights in Borge Outland's list of achievements. On January 23rd, Borge and expedition partner Mike Horn left Cape Arktichesky and started the battle against the cold and darkness on the dangerous drifting ice. After more than two months, fighting open water, polar bears, minus 40 conditions and an infection that nearly killed Mike, they reached the Geographical North Pole 23rd of April. 2003, Crossing Patagonia ice cap. That year, the couple Ousland/Ulrich succeeded in crossing the Patagonian Ice Fields without outside support. The expedition started by kayak from Tortel, over the inland ice fields on skis and sled, and 54 days later they finally paddled to Puerto Natales in their kayaks. The combination of Thomas as a mountain climber and Børge as a polar veteran was very successful on this very difficult expedition that, for example, included a 600-meter rappel. 2002, Reconnaissance trip to Patagonia. Børge Ousland and Thomas Ulrich made a reconnaissance trip to Patagonia in Chile to study the area for a new expedition. Up to that point nobody had managed to cross the southern Patagonian Ice Field unsupported; the third largest glacier in the world after Antarctica and Greenland. 2001, From Siberia to Canada, solo. Børge Ousland reached another milestone by being the first to cross the Arctic alone from Siberia to Canada via the North Pole in 82 days. 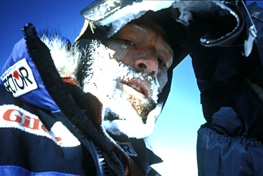 1996-97, Crossing of Antarctica (Berkner to McMurdo, solo and unsupported). The very next year, 1996-97, he successfully completed the crossing of Antarctica alone and without receiving any supplies underway. He started November 15 from Berkner Island in the Weddell Sea and he reached the McMurdo base by the Ross Sea on January 17. He had then been underway 64 days and covered a distance of 2845 km. The lowest temperature experienced was minus 56 degrees Celsius. At start the sledge weighed 178 kilos. The maximum altitude reached was about 3400 meter above sea level. 1995, Crossing of Antarctica (attempt). The next challenge was to be the first to cross Antarctica alone without support from coast to coast via the South Pole. In 1995 Ousland had to abandon this trip due to frost injuries after having passed the South Pole itself. Although he did not complete the crossing, he then became the first person to have skied alone without support to both poles. 1994, From Siberia to NP, solo and unsupported. Although the North Pole trip in 1990 had created a lot of interest in Norway and abroad, it was nothing compared to the attention created following his solo trek to the North Pole in 1994, also completed without any outside support. He started from Cape Arktichesky in Northern Siberia on March 2, 1994 and arrived at the North Pole 52 days later on April 22. After successfully completing this expedition Børge Ousland has worked full time on expeditions and the tasks associated with these. 1993, From Frans Joseph Land to Svlabard. Børge Ousland and Agnar Berg attempted in 1993 to ski across the drift ice from Frans Josef Land to Svalbard, but the expedition had to be aborted when they encountered large areas of open water. 1990, First unsupported ski trek to NP. The next expedition was in 1990 when Børge, Geir Randby and Erling Kagge set out from Ellesmere Island in Canada for the North Pole without receiving any supplies underway. Randby had to be picked up due to an injury, but Ousland and Kagge completed the trip in 58 days (March 8 to May 4, 1990). This was the first unsupported ski trek to the North Pole; a distance of 800 km. 1986, Skiing accross Greenland. In 1986 Børge and two of his diving colleagues, Agnar Berg and Jan Morten Ertsaas, skied across Greenland. In 37 days they traveled from Angmassalik on the east coast to Umanak on the west coast, a distance of 800 km in direct line. At that time only a few had traveled across the inland ice since Fritjof Nansen and five companions first made the crossing in 1888. Ousland has twice climbed mountains higher than 8 000 meters in the Himalayas (Cho Oyo in 1999; in 2003 he had to turn back just below the peak of Mount Everest).